Established 20 years ago, Exeter-based motorcycle aftermarket specialist HEL Performance (www.helperformance.com) has for half of that time manufactured its brake line fittings in-house from stainless steel bar using an array of sliding-head CNC lathes, of which 14 are currently in use. The idea was to have full control not only over the design but also over the production and quality of these mainline products. 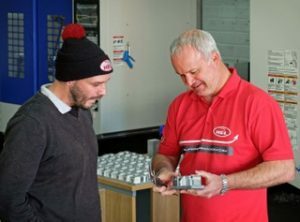 Simon Lane (right), managing director of HEL Performance, with programmer/machinist Simon Purchase in front of the Brother Speedio machining centres. The company could therefore not have moved further away from its comfort zone when it decided to manufacture two new families of prismatically-machined components from solid aluminium billets, namely master cylinders and radially mounted brake calipers. Turnkey production systems were clearly needed and managing director Simon Lane researched the market for a suitable machine tool supplier, an exercise which culminated in the purchase from Whitehouse Machine Tools (www.wmtcnc.com) of three Speedio machining centres built by Brother, Japan. The Speedio M140X2 5-axis machining centre (left) and one of the Speedio S700X1 4-axis machines on the shop floor in Exeter. 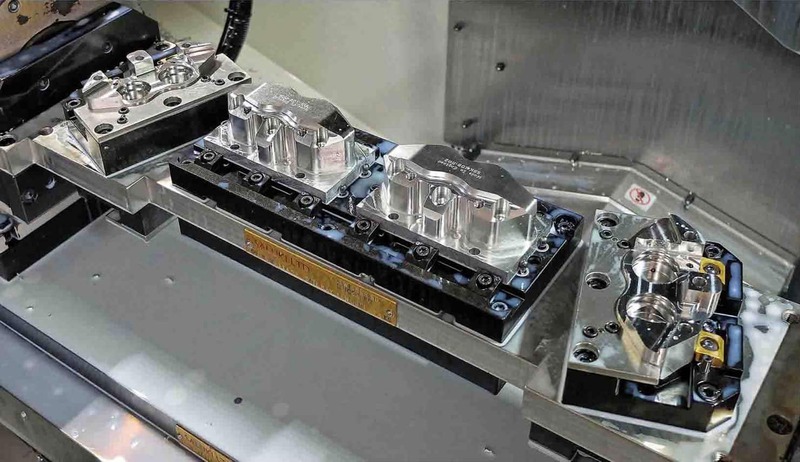 Supplied with tooling, fixtures and programs, two are S700X1 4-axis, 21-station turret-type models installed in March and June 2018, while the third is an M140X2 trunnion-type, 5-axis machine with a 22-position tool magazine, which arrived in August. Mr Lane commented, “With no track record of prismatic machining, we undertook a joint research project with the University of the West of England in Bristol to study the feasibility of producing the new parts. We then installed a second-hand, 3-axis mill to produce some components to get a feel for the process. 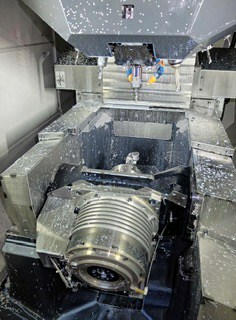 Cutting feed in the 700 x 400 x 300 mm axes of the S700X1s is 30 m/min, rapid traverse rate is significantly faster, and tool change is 1.4 seconds chip-to-chip, performed at the same time as X and Y axis movements and rotation of the indexer. The machine sits in a compact footprint of slightly more than 4.5 square metres on the shop floor. 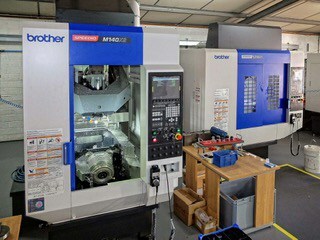 Brother’s latest CNC C00control provides fast processing, a wide range of functions and high machining accuracy. The Speedio M140X2 has an integrated, direct-drive motor powering the C-axis table that allows components to be turned at up to 2,000 rpm. 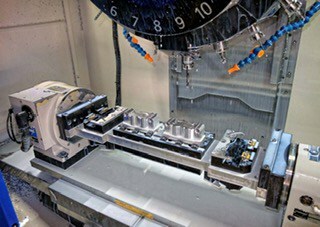 Another view of the Speedio M140X2, showing a master cylinder being machined from an aluminium billet. The A-axis trunnion rotates from +120 to -30 degrees, allowing machining of features at the rear of components and facilitating loading and unloading of parts at the front of the machine. The M140X2 has the same control and is similarly fast throughout its 200 x 440 x 305 mm working volume. Cutting feed rate is identical and non-cutting motions take place simultaneously in all five axes to minimise idle time. The spindle has a 0.2 second start / stop time, while the turning table accelerates from zero to 2,000 rpm in less than 0.3 second. A trunnion holding force of 400 Nm without the need for mechanical clamping delivers high speed indexing combined with rigidity when milling parts at an angle. A major benefit of these modern Brother machines is that they have been designed with energy saving measures in mind, including LED lighting and power regeneration from the high efficiency motors. 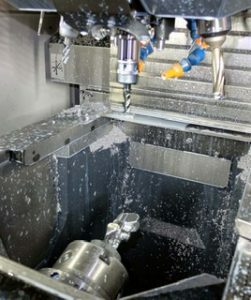 Power consumption is up to 80 per cent lower compared with the manufacturer’s earlier machining centres, which is of great utility to HEL Performance, as its factory is located in the Devon countryside at the end of an electricity spur. Had more power-hungry machines been installed, it would have been necessary to invest in a new and expensive sub-station to provide sufficient power. A part-machined master cylinder with 19 mm bore. Eventually, three different sizes will be produced. The S700X1 machines are currently devoted to producing either ‘100’ or ‘108’ caliper sets in two operations using bespoke, 4-station fixtures on either side of a trunnion, so two complete components come off each machine every time the doors open. In the M140X2, one master cylinder is produced in two operations in a total cycle time of one hour. A short run of ‘108’ brake caliper sets being completed on one of the Brother Speedio S700X1 21-station, turret-type machining centres. These ‘100’ caliper sets, retained on the other side of the 4th-axis trunnion in a Saluki fixture, are in full production. The two centre components started as cuboid aluminium billets and have undergone op 1. The previous pair were inverted and transferred to the two outer stations, where op 2 has been completed in the same cycle. 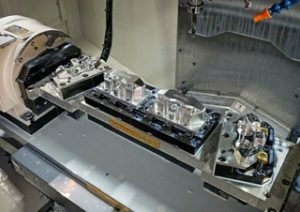 When fully operational, each of the three Speedio machines will produce around 100 components per week, based on a single 8-hour shift per weekday. Mr Lane foresees quantities rising fourfold in the next five years and has already expressed interest in acquiring a Brother Feedio robotic component handling system to increase production efficiency and introduce unattended running overnight. Positioning the automation unit to the side allows it to serve two machines and maintains accessibility to the working areas of the Speedios from the front. 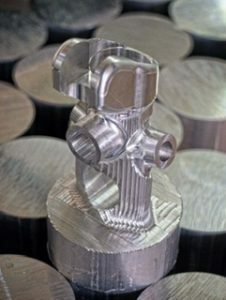 Mr Lane concluded, “While many aftermarket parts in our industry are produced from castings or forgings, we specialise in machining ours from solid billet. Customers really appreciate the beautiful fettled finish we achieve and often visit to see the parts being made.